Cole "Rush" Allen is a chip off the old block - yep Tack’s offspring through and through... maybe a little more easy-going. He is protective, openly adores his woman, yet so bossy. “You’re lucky you’re a great f**k.” I grinned. Rebel is perfect for Rush... A feisty redhead who's compassionate, quirky, has a great sense of humour and sass. A woman who feels deeply and has a heart of gold. ‘Free’ was tremendously emotional, a definite must-read. I was thrilled to see cameos from so many past loves like Knight, Raid and some of the Dream Man hotties. As expected, Kristen Ashley led me on another incredible journey as she created a moving tale of undeniable love, vengeance, forgiveness, redemption and most importantly the unbreakable bonds of family and brotherhood. Kristen Ashley is the author who introduced me to American contemporary romance some years ago. 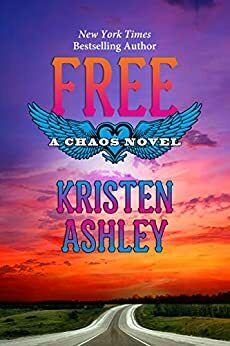 I've read all her titles (except 'The Honey' ones) now sadly, the Chaos series has come to an end with 'Free'. The final book fittingly finishes with Cole 'Rush' Allen, son of the first featured character, President of Chaos, Kane 'Tack' Allen. As expected, the narrative is a blockbuster with action, intensity, loose ends tied, redemption and continued, rock-solid loyalties. In amongst the fray, Rush loses his heart to Rebel Stapleton: unconventional, formidable, big-hearted and striking. Rush's persona shines through as: manly, honourable, confident, cheeky, devoted and protective. Kristen Ashley creates an energetic plot for this book and makes a spot for all the Chaos crew, other book heroes and foes. Even some minor characters pop up. It's obvious from her skilled, yet emotional writing that she loves the characters and takes care to steer them through to the end. There were a lot of POVs, but I was fine with that because I know all the plotlines and characters from previous books, so that rested easily with me...you know Kristen will always be thorough. The conclusion was satisfying, but bittersweet because it is the end of a fabulous series...and Chaos are finally free. I love KA epilogues - she does THE BEST epilogues, and I really look forward to that little bit extra at the end of every book. I don't think she knows how to write a short one, which is awesome for the reader. Of course the epilogue for Free was so good! I have been anticipating this book for what feels like forever, even more so after Rush and Rebel's brief appearance in one of the Loose Ends novellas. To finally get Rush's HEA! Free was filled with crossover appearances from all my favourite characters from KA's other series, and there were MULTI POV's. SO many POV's, I certainly wasn't expecting so many. Whilst that was great, I also wanted more of just Rush and Rebel's POV. I'm really unsure of how I felt at the end about Beck ( Throttle ). After what he and his club did to Rosalie in a previous book I felt pretty 'meh' about him, but he played an important role in the plot and I liked Janna. Lots of Diesel and Maddox as well, and I love those guys. My first KA book I struggled with. Too many points of view. Too many ongoing story lines. Way too many characters it was so hard to keep track. It should have been 2 books, 1 for Rush and 1 ro wrap up Chaos. It was the first book I found covered in grammatical and editing errors. Mispelt words, missing words etc. Not KAs style. I'm a huge fan and felt really let down by this one and the reviews seem to show I'm not the only one. The ending with Benito was a let down and missed all the build up. Okay, I am a huge fan of KA novels...but this now seems to only be largly true for her earlier novels. I almost wish I never read this so I could still live with hope. I found it boring and unsatisfying, and like some others, often skipped large chunks of story just to get to the end - and that too weeks instaed of usual couple of sleepless nights! The sexual tension, friction and romance between two leads, which she has done so well in the past, and steeped in very realistic emotions, was absent. The male/female leads met, and then pretty much together - no hurdles, no disagreements, no discussion at all really. And as much as I loved the first 3 books, inc of course the amazing Tack/Tyra start (lost count of times read), and all the Chaos men, the drama just got sillier as did the almost juvenile dialogue. Often cringeworthy in the case of the men. I was actually hoping that the female lead was an undercover cop, as thought that would be a great cause of friction, and a challenge to the club, and I still wish that had been the case. Just bleh. Loosing faith here, and the two stars was being generous.